is a food paste made primarily from ground roasted peanuts, with or without added oil. It is popular throughout the world and is also manufactured in some emerging markets. Its primary use is as a sandwich spread. Similar peanut pastes are popular in various cultures. In South Indian cooking, chili peppers are added to make a spicy variant of peanut paste. In Andhra Pradesh, India, peanut chutney is popular. In this variation, peanuts are ground and mixed with chili peppers and other ingredients. In some types of gourmet peanut butter, chocolate or other ingredients may be added. Various nut butters are also made from other nuts. Peanut butter may protect against a high risk of cardiovascular disease due to high levels of monounsaturated fats and resveratrol; butter prepared with the skin of the peanuts has a greater level of resveratrol and other health-aiding agents. Peanut butter (and peanuts) provide protein, vitamins B3 and E, magnesium, folate, dietary fiber, arginine, and high levels of the antioxidant p-coumaric acid. 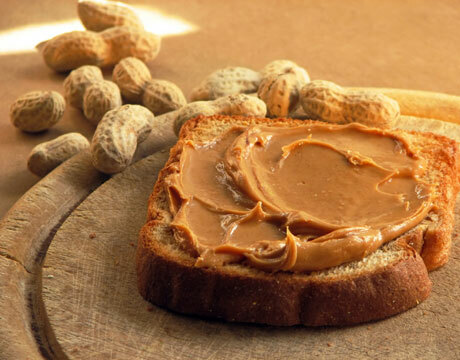 For people with a peanut allergy, peanut butter can cause reactions including anaphylactic shock which has led to its banning in some schools. The peanut plant is susceptible to the mold Aspergillus flavus which produces a carcinogenic substance called aflatoxin. Since it is impossible to completely remove every instance of aflatoxins, contamination of peanuts and peanut butter is monitored in many countries to ensure safe levels of this carcinogen. Average American peanut butter contains about 13 parts per billion of aflatoxins, a thousand times below the maximum recommended safe level. Some brands of peanut butter may contain a large amount of added hydrogenated vegetable oils, which are high in trans fatty acids, thought to be a cause of atherosclerosis, coronary heart disease, and stroke; these oils are added to make the butter easier to spread. Natural peanut butter, and peanuts, do not contain partially hydrogenated oils. 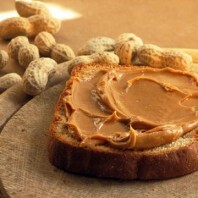 A USDA survey of commercial peanut butters in the US did not show the presence of trans fat. Also, at least one study has found that peanut oil caused relatively heavy clogging of arteries. Robert Wissler, of the University of Chicago, reported that diets high in peanut oil, when combined with cholesterol intake, clogged the arteries of Rhesus monkeys more than did butterfat. So, to sum up; peanutbutter good, additives bad. As always, read the labels, look for and avoid added anything. The shorter the list, the better. Avoid hydrogenated vegetable oils. Jelly is strictly defined in the US as: That semisolid food made from not less than 45 parts by weight of fruit juice ingredient to each 55 parts by weight of sugar. This mixture is concentrated to not less than 65 percent soluble solids. Pectin and acid may be added to overcome the deficiencies that occur in the fruit itself. Flavoring and coloring agents may also be added. The name of the fruit used in making the jelly must be stated with other ingredients, in order of declining by weights, on the label of such products offered for sale in the US. Store bought jellies or Jams generally contain more additives than home made. If you can get home made from a friend or relative that knows how to preserve, do it. It will almost always be better. Long story short. Use good canning practices, use good ripe fruit and after you open it put it in the refrig. Also remember that there are a lot of sugars in jelly and that will spike your blood sugar. Avoid sugar when ever possible. Side bar- Jelly is made from juice, Jams are made with the fruit pulp in it, Fruit Butter is the smooth, semisolid paste with a ratio of five parts fruit to two parts sugar, and Marmalade is usually made from citrus fruit or may contain a citrus peel. This can be a controversial subject, because of the fishing methods used to obtain the fish. Very large nets are strung out for miles and pulled in catching everything that’s out there. Sharks are caught in the nets and drown, because they need to keep moving at all times. Sea turtles are also caught and die in the nets. Mostly people are upset about the dolphins getting caught and dieing or being injured in the nets. With that said. Tuna is a great source of nutrition. Most of the next paragraphs come from Wikipedia. Tuna is an important commercial fish. Some varieties of tuna, such as the bluefin and bigeye tuna, Thunnus obesus, are threatened by overfishing, which dramatically affects tuna populations in the Atlantic and northwestern Pacific Oceans. Other areas seem to support fairly healthy populations of some of the over 48 different species of tuna —for example, the central and western Pacific skipjack tuna, Katsuwonus pelamis—but there is mounting evidence that overexploitation threatens tuna populations worldwide. The Australian government alleged in 2006 that Japan had illegally overfished southern bluefin by taking 12,000 to 20,000 tonnes per year instead of the their agreed 6,000 tonnes; the value of such overfishing would be as much as USD $2 billion. Such overfishing has resulted in severe damage to stocks. According to the WWF, “Japan’s huge appetite for tuna will take the most sought-after stocks to the brink of commercial extinction unless fisheries agree on more rigid quotas”. Increasing quantities of high-grade tuna are entering the market from operations that rear tuna in net pens and feed them a variety of bait fish. In Australia the southern bluefin tuna, Thunnus maccoyii, is one of two species of bluefin tunas that are kept in tuna farms by former fishermen. Its close relative, the northern bluefin tuna, Thunnus thynnus, is being used to develop tuna farming industries in the Mediterranean, North America and Japan. Due to their high position in the food chain and the subsequent accumulation of heavy metals from their diet, mercury levels can be high in larger species such as bluefin and albacore. As a result, in March 2004 the United States FDA issued guidelines recommending that pregnant women, nursing mothers and children limit their intake of tuna and other types of predatory fish. However, most canned light tuna is skipjack tuna, which is lower in mercury. The Chicago Tribune reported that some canned light tuna such as yellowfin tuna is significantly higher in mercury than skipjack tuna, and caused Consumers Union and other health groups to advise pregnant women to refrain from consuming canned tuna. The Eastern little tuna (Euthynnus affinis) has been available for decades as a low-mercury, less expensive canned tuna. However, of the five major species of canned tuna imported by the United States it is the least commercially attractive, primarily due to its dark color and more pronounced ‘fishy’ flavor. Its use has traditionally been restricted exclusively to institutional (non-retail) commerce. While in the early 1980s canned tuna in Australia was most likely to be Southern bluefin, as of 2003 it is usually yellowfin, skipjack, or tongol (labelled “northern bluefin”). As tuna are often caught great distances from where they are processed, poor quality control may lead to spoilage. Tuna are typically eviscerated by hand, then pre-cooked for 45 minutes to three hours. The fish are then cleaned and filleted, packaged into cans, and sealed. The second cooking of the tuna meat (called retort cooking) is carried out in the cans, this time for 2 to 4 hours. This process kills any bacteria, but retains the histamine that can produce rancid flavors. The international standard sets the maximum histamine level at 200 milligrams per kilogram. An Australian study of 53 varieties of unflavored canned tuna found none to exceed the maximum histamine level, although some had “off” flavors. Many tuna species associate with dolphins, swimming alongside them. These include yellowfin tuna in the eastern Pacific Ocean, but not albacore or skipjack. The reason for the association is believed to be the avoidance of dolphins by sharks, which are predators of tuna. Swimming near dolphins reduces the likelihood of the tuna being attacked by a shark. Fishing vessels can exploit this association by searching for pods of dolphins. They encircle the pod with nets to catch the tuna beneath. The nets are prone to entangling dolphins, thus injuring or killing them. As a result of public outcry, methods have been made more “dolphin friendly”, now generally involving lines rather than nets. However, there are neither universal independent inspection programs nor verification of “dolphin safeness” to show that dolphins are not harmed during tuna fishing. According to Consumers Union, the resulting lack of accountability means claims that tuna that is “dolphin safe” should be given little credence. Canned tuna is a prominent component in many weight trainers‘ diets, as it is very high in protein and is easily prepared. Tuna is an Oily fish, and therefore contains a high amount of Vitamin D. A can of tuna in oil contains about the Adequate Intake (AI) of the US Dietary Reference Intake of vitamin D for infants, children, men, and women aged 19–50 – 200 UI. To summarize: Canned tuna is a great source of protein. Avoid tuna packed in oil. If you don’t want to risk the off flavor associated with cans, look for pouch packaged tuna. If you don’t want to hurt other fish, buy only line caught tuna, or tuna steaks. If you don’t want to risk mercury poisoning or IF YOU ARE PREGNANT, avoid tuna all together. Raisins are dried grapes. They are produced in many regions of the world, such as the United States, Australia, Chile, Argentina, Mexico, Greece, Turkey, India, Iran, Pakistan, China, Afghanistan, Togo, and Jamaica, as well as South Africa and Southern and Eastern Europe. Raisins may be eaten raw or used in cooking and baking. Raisin varieties depend on the type of grape used. Seedless varieties include the Sultana (also known as “Thompson Seedless” in the USA) and Flame. Raisins are typically sun-dried, but may also be “water-dipped,” or dehydrated. “Golden raisins” are made from Sultanas, treated with Sulfur Dioxide (SO2) , and flame dried to give them their characteristic color. A particular variety of seedless grape, the Black Corinth, is also sun dried to produce Zante currants, mini raisins that are much darker in color and have a tart, tangy flavour. Several varieties of raisins are produced in Asia and, in the West, are only available at ethnic specialty grocers. Green raisins are produced in Iran. Raisins have a variety of colors (green, black, blue, purple, yellow) and sizes. Raisins are about 60% sugars by weight, most of which is fructose. Raisins are also high in certain antioxidants, and are comparable to prunes and apricots in this regard. As for all dried fruits, raisins have a very low vitamin C content. The natural sugar in grapes crystallizes during the drying process. Raisins are sweet due to their high concentration of sugars. If they are stored for a long period, the sugar inside the fruit crystallizes. This makes the dry raisins gritty, but does not affect their usability. The sugar grains dissolve when the raisins are swelled in (hot) water. The consumption of grapes and raisins presents a potential health threat to dogs. Their toxicity to dogs can cause the animal to develop acute renal failure (the sudden development of kidney failure) with anuria (a lack of urine production). The phenomenon was first identified by the Animal Poison Control Center (APCC), run by the American Society for the Prevention of Cruelty to Animals (ASPCA). A trend was seen as far back as 1999. Approximately 140 cases were seen by the APCC in the one year from April 2003 to April 2004, with 50 developing symptoms and seven dying. The reason why some dogs develop renal failure following ingestion of grapes and raisins is not known. Types of grapes involved include both seedless and seeded, store bought and homegrown, and grape pressings from wineries. A mycotoxin is suspected to be involved, but one has not been found in grapes or raisins ingested by affected dogs. The estimated toxic dose of grapes is 32 g/kg (grams of grapes per kilograms of mass of the dog), and for raisins it is 11–30 g/kg. The most common pathological finding is proximal renal tubular necrosis. In some cases, an accumulation of an unidentified golden-brown pigment was found within renal epithelial cells. Vomiting and diarrhea are often the first symptoms of grape or raisin toxicity. They often develop within a few hours of ingestion. Pieces of grapes or raisins may be present in the vomitus or stool. Further symptoms include weakness, not eating, increased drinking, and abdominal pain. Acute renal failure develops within 48 hours of ingestion A blood test may reveal increases in blood urea nitrogen (BUN), creatinine, phosphorus, and calcium. Emesis (induction of vomiting) is the generally recommended treatment if a dog has eaten grapes or raisins within the past two hours. A veterinarian may use an emetic such as hydrogen peroxide or apomorphine to cause the dog to vomit. Further treatment may involve the use of activated charcoal to adsorb remaining toxins in the gastrointestinal tract and intravenous fluid therapy in the first 48 hours following ingestion to induce diuresis and help to prevent acute renal failure.Vomiting is treated with antiemetics and the stomach is protected from uremic (damage to the stomach from increased BUN) with H2 receptor antagonists. BUN, creatinine, calcium, phosphorus, sodium, and potassium levels are closely monitored. Dialysis of the blood (hemodialysis) and peritoneal dialysis can be used to support the kidneys if anuria develops. Oliguria (decreased urine production) can be treated with dopamine or furosemide to stimulate urine production. The prognosis is guarded in any dog developing symptoms of toxicosis. A negative prognosis has been associated with oliguria or anuria, weakness, difficulty walking, and severe hypercalcemia (increased blood calcium levels). You might have noticed that I added Mango Chutney to the bottom of the list. This was a suggestion from Mittie. We’ll talk more about it when we get there. Thanks, Mittie, for the input.